The ladies love celebrity chef Rocco DiSpirito. He recently took part in "Dancing with the Stars." And he's got a new, best-selling cookbook. Rocco heated up "The Early Show Saturday Edition", accepting our "Chef on a Shoestring" challenge! He's helping cooks in kitchens all over prepare healthy comfort food. That's right - comfort food that's healthy! Rocco's most recent cookbook is already topping New York Times sales charts. And he used recipes from "Now Eat This: 150 of America's Favorite Comfort Foods, All under 350 Calories" on the show (Click here to see excerpt). As our "Chef on a Shoestring," he sought to prep a three-course meal for four on our measly $40 budget. His menu started with a Steakhouse Style Salad with blue cheese and bacon, followed by Charred Beef Burgers with sweet potato french fries and, for dessert, a Peach and Blueberry Cobbler. Rocco could also claim another bit of notoriety if he wins our "How Low Can You Go?" competition. The "Shoestring" chef with the lowest ingredients costs will be invited back to whip up our year-end holiday feast! Cut the iceberg lettuce into 4 wedges. Place 1 wedge on each of 4 salad plates, and top each wedge with some red onion and tomato. Drizzle each wedge with blue cheese dressing, and top it with crumbled blue cheese and bacon. Season the salads with salt and pepper to taste, and serve. Char the eggplant over an open flame, rotating it often to cook evenly, about 20 minutes. The skin should be completely blackened and the flesh should be cooked through. Place the eggplant in a bowl, cover it tightly with plastic wrap (to steam off the skin), and set it aside for 5 to 10 minutes. Then remove the charred skin with a paper towel, leaving the flesh behind. Chop the eggplant with a knife until it is a thick and chunky puree. Mix the eggplant and the yogurt together in a bowl, and season it with salt and pepper to taste. Split the buns in half, and spray the split surfaces lightly with cooking spray. Season the burger patties with salt and pepper to taste. Place the buns, cut sides down, and the burgers on the grill. Allow the buns to char slightly, and then transfer them to a platter. Cook the burgers for about 2-1/2 minutes per side for rare. To assemble the burgers, spread the bottom buns with some of the eggplant mixture. Place the burgers on top, and then top each burger with some of the Russian dressing. 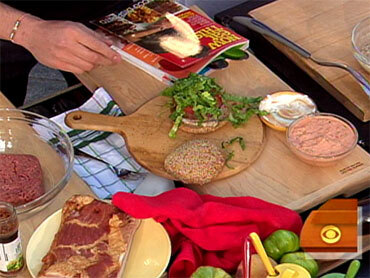 Pile the tomato, onion, and lettuce on the burgers, and set the bun tops in place. Serve. Slice the sweet potatoes lengthwise into 1/4-inch-thick slices. Cut the slices into 1/4-inch-wide sticks. Place the sweet potatoes in a large bowl and sprinkle generously with salt. Let stand for about 20 minutes to release some of their moisture. Meanwhile, preheat the oven to 450°F. Place a wire rack on a baking sheet, and set it aside. Spread the potatoes out on paper towels to absorb any excess moisture. Then place them in a large bowl, and spray them with cooking spray. Sprinkle with the thyme and salt, pepper, paprika, and cayenne to taste. Spread the potatoes out on the prepared baking sheet. Bake the fries until they are golden and tender, 35 to 45 minutes. Serve immediately. Preheat the oven to 425˚F. Spray a 7 X 11-inch glass baking dish with cooking spray, and set it aside. In a medium bowl, mix together the peaches, blueberries, the 1/4 cup Splenda, and the 1 tablespoon baking mix. Pour the fruit mixture into the prepared baking dish. In a medium bowl, combine the remaining 2 tablespoons Splenda, the remaining 3/4 cup Bisquick, and the ginger, cinnamon, and milk. Stir until the mixture forms a soft dough. Drop spoonfuls of the dough evenly over the fruit mixture. Sprinkle the sugar over the dough. Bake the cobbler until the fruit is tender and the biscuit topping is golden brown, about 30 minutes. Let it rest for 5 minutes before serving. So, how did Rocco fare in our "How Low Can You Go?" competition? !